It's been a while since my last trip to the cinema (I think it was Insidious?) and it's just good that it was Real Steel that I watched. Because I kinda love it, robot boxing violence and all. 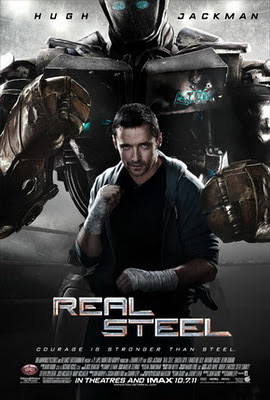 A quick run on the synopsis; Real Steel takes place somewhere in the near future, year 2020 or so, where robots have replaced humans in the boxing ring. Yup, humans don't have to get hurt no more, instead they just control the robots with high-tech looking consoles or hand-held controllers. Some robots (a.k.a Noisy Boy) could even take in voice commands. Just speak into a bluetooth-like headset and instruct the robot; "upper-cut! dodge! swing left! swing right!" - well, you get the drill. So we have Hugh Jackman playing the lead role as Charlie Kenton, a former boxer but who is now kinda in a deep debt which he trying to pay off by earning big money in robot boxing. Unfortunately things aren't going too well for him at all due to his hastiness and over-confidence. His first robot, Ambush, got totally mauled by a real-life bull and Charlie finds himself in hot soup which he could only try to run away from (but you know soon the bad stuff catches back up on you). He also finds himself having to take care of his preteen son, Max, whom he couldn't care-less (at first) and only agreed to the baby-sitting for the money (to buy a new robot so that he can earn back his cash asap). Then there's Bailey (played by the beautiful Evangeline Lily of Lost fame), childhood friend of Charlie, who is in love with him but had to ask him to leave as she could no longer support his debts while maintaining her deceased father's boxing gym. And the movie goes about detailing more fights while focusing on the father-son relationship. So what made the movie stand out? You might think it's just robot boxing and that's that. Or perhaps it would only appeal to the guys with all the actions and fighting. Truth is Real Steel is more than that. In fact, it's so good that for once the girls wouldn't mind watching robots fighting. The movie has such passion in it that it simply moves the viewer. It sure moved me at least. I enjoyed the movie from start to end and there wasn't really any moments/scenes that I disliked. It was exciting watching all the fights and the moves as if they were real and I was standing by the ringside. I grimaced at the violence but I also had a good laugh at all the antics. From the great Midas stroking his red Trojan hair after thrashing Noisy Boy, from the mighty Zeus flattening some unknown robot's head with just a clap of the hands, and definitely the dancing moves of Atom, the sparring robot that Max had to dug up on his own at some junkyard, no thanks to his dad who refused to help him! And of course, the father and the son. Max is adorable and smart (or genius, so he says) and in actual, looks up to his dad and just wants Charlie to fight for him. The scenes between them are realistic, humorous and personal that it touches me as well as tickles me. It is only because they are so alike that they are always at loggerheads with each other but it sure keeps the audience entertained. But what makes the movie stand out is really the cinematography. Kudos to director Shawn Levy for his visions. The angles, the lightings, the settings are just beautiful and very well captured. Even Charlie's pose while pumping gas was hilarious but way COOL. Levy is great at catching those moments; the frustration here, the anger there, the triumphs and the tears. i watched this movie twice in a week and yet i dun mind to watch it for the third time.. thumbs up! yalo, that scene of HughJackman pumping petrol one was really funny but super the yeng..keke..he even act cool standing there while his son spent all night long to dig out that Atom and kena punched by Max..lol..
wow, even more diehard than I am! -Both Charlie & Max talking to Atom and the other one will quotes, "You know you're talking to robot", which Charlie one is more funny & touching as it's the fight with Zeus.